The Select is a desktop video magnifier for people with low vision. With the Select, you can easily read books and newspapers, write letters, manage your finances, do hobbies and much more. Featuring a flexible 3 in 1 camera, the Select is ideal for near, distance and self viewing. The Select Desktop Video Magnifier is designed to fit the individual end user with fully adjustable positioning of both monitor and camera. Position the auto focus camera for distance and side viewing, straight down for reading documents or even aimed back at the user as a mirror image. Provides choice of true color, enhanced black on white and reverse white on black contrast viewing. It magnifies 2X to 65X. All controls are conveniently placed on the bottom of the monitor for easy operation. 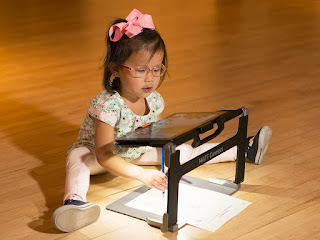 The monitor is connected to an adjustable arm, which may be positioned above, level, to the left or right of the X - Y table to provide the customer with the most comfortable viewing angle. The Select X - Y table is unique in that it contains a small storage space for pens and papers. 3 in 1 Camera: Near, distance and self viewing. Click this link to purchase the SELECT Versatile Video Magnifier or call 800-560-7226.